Here is a food that kids love to hate. 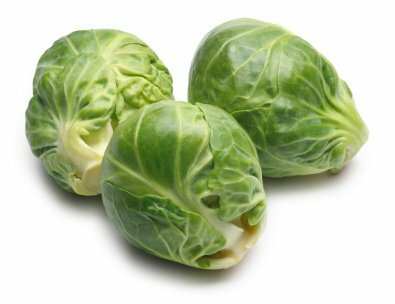 We think it has to do with its smelly cabbage taste when Brussels sprouts are overcooked. Most adults don't like Brussels sprouts either (as evidenced by their lack of appearance on the McDonald's menu). But, we think we have come up with a way to help you enjoy them. Don't boil them - roast them. Roasting brings out the sweeter part of their flavor and enhances the good things about Brussels sprouts. The smaller the Brussels sprout the better. Reject any with yellow or loose leaves, or leaves that are not tightly packed. Look for Brussels sprouts in the winter and spring. We think the easiest way to enjoy Brussels sprouts is to roast them. Heat your oven to 350 F. Cut off end and any loose leaves and then cut in half. Place Brussels sprouts in a rimmed baking sheet and add a few tablespoons extra virgin olive oil, salt, and pepper. Mix up with your hands and roast until fork tender - about 30-40 minutes. Try to cut the leaves in small bits that are easy for baby to chew, or puree them and mix with rice cereal or yogurt. They will last a week in the bottom of your refrigerator in a plastic bag. We couldn't find any information about pesticides in conventionally grown Brussels sprouts. So to err on the side of caution, buy organic when possible.